The German cockroach is the most common species of the cockroach. German cockroaches can breed at a rate of up to six generations per year. The German cockroach can fit through an opening as small as 3/8 inch in width. They are light brown to tan, with two dark, almost parallel strips located on their backs just behind their head. They are oval in shape with 6 legs, are about 1/2 -5/8 inches long and have antennae. German cockroaches will feed on almost anything, including soap, glue, toothpaste, furniture, and more. German cockroaches are good hitchhikers and often find their way into new structures via grocery bags, cardboard boxes, drink cartons and secondhand appliances. German cockroaches prefer to live in warm, humid places close to food and moisture sources. They are frequently found in residential and commercial kitchen environments and bathrooms, but have the capability of living in any portion of any heated structure. 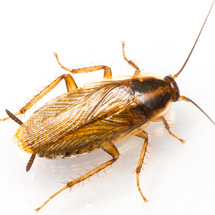 Once there is a cockroach infestation, it can be very hard to get rid of them. Cockroaches multiply very quickly and they also adapt quickly. Once cockroaches infest a home, they are rarely seen. However, once you start seeing them regularly, especially during daylight hours, it is a good indication that you may have a heavy infestation. The cockroach’s harbourage areas have become full and they are seeking out new places to invade. Cockroaches are nocturnal and can live up to a month with little or no food. The German cockroach has three developmental stages: egg, nymph, and adult. Females produce a light brown, purse-shaped egg capsule that is less than 1/4 inch long and contains two rows of eggs. Each capsule contains up to 48 eggs and adult females usually produce from four to eight egg capsules during their lifetime. One capsule is produced about every 6 weeks. Egg capsules are carried, protruding from the abdomen, until hatching. It usually takes 28 days for the capsule to hatch from the time it begins to form. Formation of the next egg capsule usually begins within a couple of weeks. The length of the egg stage varies from 14 to 35 days, with 6 to 7 nymphal stages (instars) occurring over a period of 6 to 31 weeks. The life span of the adult female varies from 20 to 30 weeks. In one year over 10,000 descendants can be produced, assuming two generations per year. Adult German cockroaches are 1/2 to 5/8 inch long and tan to light brown. Although they have fully developed wings, they do not fly. Nymphs are similar in appearance to adults except that they are smaller and lack wings. The German cockroach is best identified by its small size and by two dark parallel lines running from the back of the head to the wings. German cockroaches also have a huge economic impact. It has been established for some time that cockroaches are able to carry pathogenic bacteria onto food. This can be responsible for food poisoning. Also, asthma and other allergies are known to be associated with cockroach infestations. The German cockroach is the cockroach we find here in southeast Idaho; however other roaches have been seen. Not unlike bed bugs, cockroaches require detailed treatments to control the infestation. Pest Control Services has over 40 years helping our customers get fast and effective control.